Four men were shot in a dispute on Third Avenue in Bay Ridge early Saturday. 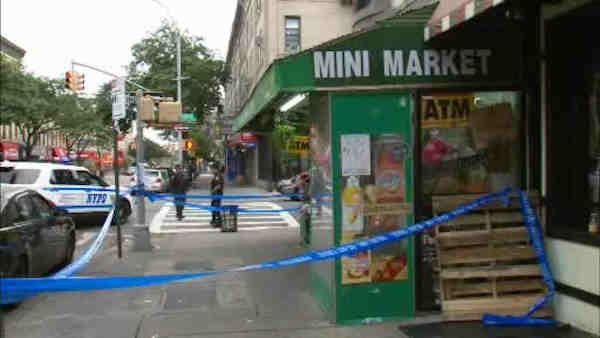 BAY RIDGE, Brooklyn (WABC) -- Four men were shot in a dispute on Third Avenue in Bay Ridge early Saturday. The shooting happened at 4 a.m. in front of a 24-hour deli at 7301 Third Ave. According to the New York City Police Department, three men were involved in a bar dispute that spilled out onto the street. The three men were shot, and two were taken to Lutheran Medical Center where they were treated for non-life threatening wounds. A third went to Lutheran on his own. A fourth person also was shot. That victim, a 28-year-old man who worked at the deli, was an innocent bystander caught up in the shooting melee, police said. It is unclear how many shooters were involved, but police confirmed three men wearing white masks and black clothing were seen fleeing toward 72nd Street. The deli owner said the confrontation was not a robbery but an argument between those involved.